A graduate of the University of Cumbria with a Bachelors of Science in Outdoor Studies, the draw of being involved in the outdoors and interacting with it has been part of my life for nearly a decade. The pull of being outside and immersing myself in the environment through Adventure sports like Mountain Biking and Skiing is a passion that shows no signs of fading. Following the work of photographer’s who work with the likes of National Geographic and Outside Magazine has also helped this focus to gather pace. Moreover, growing up in an environment where photography was very much on the agenda, my newly found desire to pursue this particular path must be partly attributed to the career and influence of my father. At the moment I have just entered a second winter season in the Canadian Coastal Mountains. 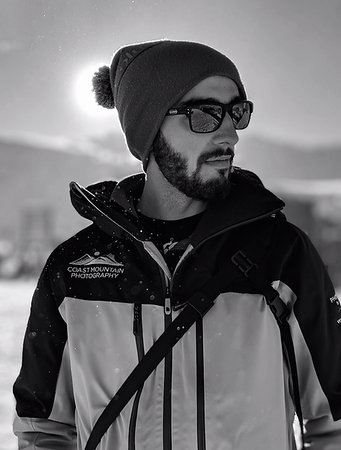 Based out of Whistler, British Columbia, my time is being spent working for Coast Mountain Photography, shooting portraits during work hours and action during my days off. My portfolio is filled with my best efforts from landscapes, through adventure sports and portraiture. Check out my 'latest' page for my updates. In choosing camera equipment, it was always important for me to ask around for reviews and insider knowledge on camera systems. Having seen the quality that the Sony Alpha Series camera's can produce, coupled to impressive reviews by close friends, this particular system seemed like the perfect starting point. For Potential Shoots and Inquiries please go to my contact page. All Photo's are also for sale upon request.